We already know that war is hell. It's also messy, which may explain why Martín Zimmerman's new antiwar play, though sometimes searing, is also such a jumble. Characters wax poetic one moment, then hit us with blunt subtext the next. Narrative gaps are patched with awkward direct address. Complex issues—the insidiousness of poverty, the seductions of violence, the banality of evil—fly like shrapnel. There's a touch of magic realism, a dash of church bashing and even some late-in-the-game divine intervention. It’s a minor miracle itself, perhaps, that this too-ambitious work doesn't implode. Told mainly in extended flashback, Seven Spots on the Sun offers the twisty story of two couples trying to survive a Latin American civil war. 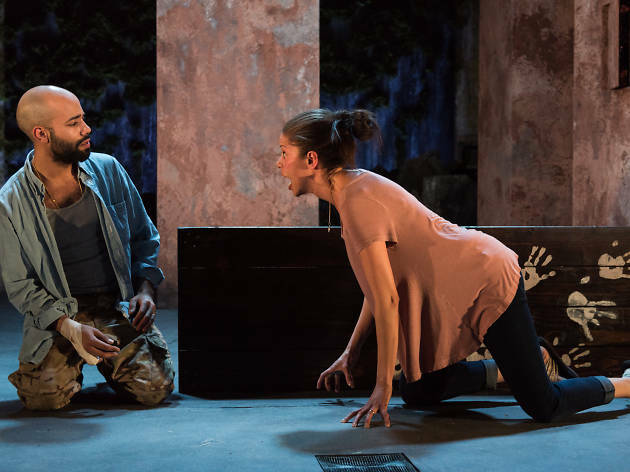 We meet young lovers Luis (a terrifying Sean Carvajal, who disintegrates before our eyes) and Mónica (the fierce Flor De Liz Perez) right after he's signed up to be a soldier, hoping it will lead to a better life. Meanwhile, in another town, doctor Moisés (the sympathetic Rey Lucas) and his wife, Belén (a fiery Flora Diaz), run a clinic where they treat wounded warriors. When they take in a fighter from the wrong side of the conflict, they too become casualties. In a postwar coda, their plots collide as the ostensible divide between hero and villain evaporates. Aiming to make his allegory seem universal, Zimmerman sets the action in a fictional country. But it's the wrong strategy. There's a generic quality to the story and the characters, though the ensemble cast, guided by director Weyni Mengesha, mitigates the latter; we always care about these people, even if we don't fully believe in them. Like a politically charged horror flick, Seven Spots on the Sun features blood, murder, torture and haunting sequences designed to keep you up at night, but there are also flashes of joy, love and hope that war cannot completely wipe out. 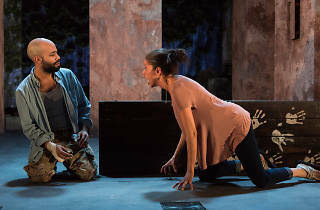 A coproduction of Rattlestick Playwrights Theater and the Sol Project, which supports Latinx playwrights, the play does not go down easy. But it's not easily forgotten. It leaves a wound. Rattlestick Playwrights Theater (Off Broadway). By Martín Zimmerman. Directed by Weyni Mengesha. With ensemble cast. Running time: 1hr 20min. No intermission. Through June 4.